张再峰, 沈志群, 陆亮. 在线富集固相萃取-超高效液相色谱串联质谱法测定地表水中对硝基苯酚[J]. 环境监控与预警, 2019, 11(2): 31-33. ZHANG Zai-feng, SHEN Zhi-qun, LU Liang. Determination of p-Nitrophenol in Surface Water by Online Solid Phase Extraction Coupled with Ultra Performance Liquid Chromatography-Triple Quadropole Mass Spectrometry[J]. Environmental Monitoring and Forewarning, 2019, 11(2): 31-33. Abstract: A method for the analysis of p-Nitrophenol in water was developed using online solid phase extraction(online-SPE) coupled with ultra performance liquid chromatography tandem mass spectrometry(UPLC-MS/MS). Filtered water samples were enriched by on-line solid phase extraction system, gradient eluted by aqueous ammonia-methanol, and then detected by tandem mass spectrometry. 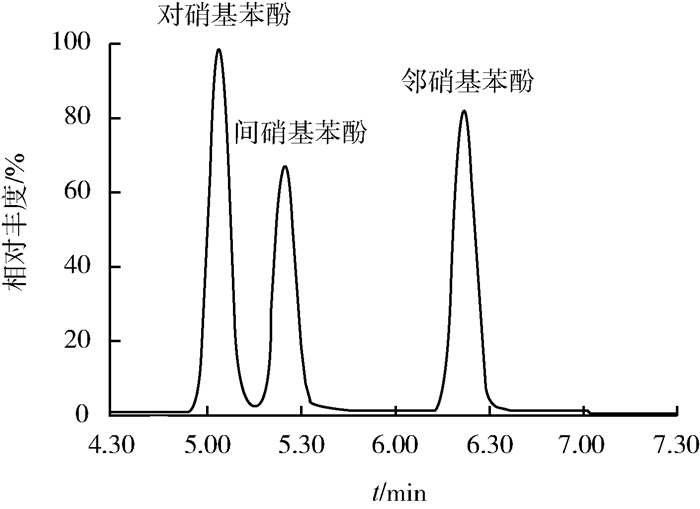 The detection limit, the recoveries and the relative standard deviations of the method were 3.52 ng /L, 91.6%~108% and 5.5%~9.5%, respectively.The method can greatly simplify the complex pretreatment process, improve the sensitivity and the accuracy, and is suitable for the analysis of p-Nitrophenol in large quantities of surface water. BHUSHAN B, CHAUHAN A, SAMANTA S K, et al. 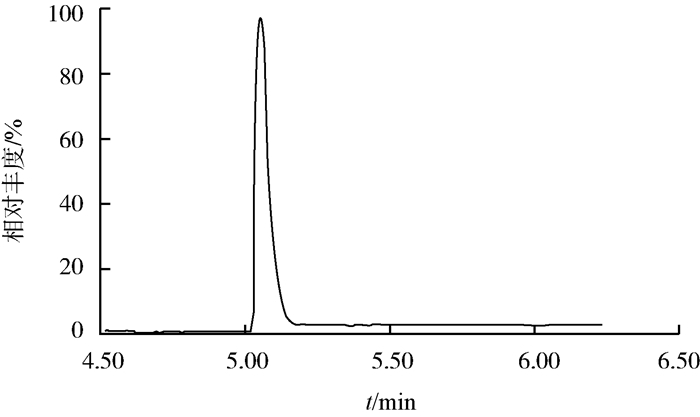 Kinetics of biodegradation of p-Nitrophenol by different bacteria[J]. Biochemical & Biophysical Research Communications, 2000, 274(3): 626-630. SUJA E, NANCHARAIAH Y V, VENUGOPALAN V P. p-Nitrophenol biodegradation by aerobic microbial granules[J]. Applied Biochemistry & Biotechnology, 2012, 167(6): 1569-1577. ISOBE T, NISHIYAMA H, NAKASHIMA A, et al. Distribution and behaviour of nonylphenol, octylphenol, and nonylphenolmo-noethoxylate in Tokyo metropolitan area: their association with aquatic particles and sedimentary distributions[J]. Environmental Science & Technology, 2001, 35(6): 1041-1049. 宋瀚文, 王东红, 徐雄, 等. 我国24个典型饮用水源地中14种酚类化合物浓度分布特征[J]. 环境科学学报, 2014, 34(2): 355-362. 刘丹, 刘济宁, 吴晟旻, 等. 太湖水体中对硝基苯酚的分布特征及风险评价[J]. 中国环境科学, 2017, 37(2): 761-767. 王志强, 张依章, 张远, 等. 太湖流域宜溧河酚类内分泌干扰物的空间分布及风险评价[J]. 环境科学研究, 2012(12): 1351-1358. 周文敏, 傅德黔, 孙宗光. 水中优先控制污染物黑名单[J]. 中国环境监测, 1990, 6(4): 1-3. 环境保护部.水质酚类化合物的测定液液萃取/气相色谱法: HJ 676—2013[S].北京: 中国环境科学出版社, 2013. 环境保护部.水质酚类化合物的测定气相色谱-质谱法: HJ 744—2015 [S].北京: 中国环境科学出版社, 2015. Environmental Monitoring and Forewarning, 2019, 11(2): 31-33.